This is a sponsored article, however all opinions (as always) are entirely my own. When my friend Kathi from Watch Me See suggested we head away for a girls hiking weekend, I jumped at the opportunity. We both needed a break from our busy lives in Edinburgh and Glasgow, and so we headed north to the Scottish Highlands. Our chosen destination was the remote Loch Ossian on the north eastern edge of Rannoch Moor, in the heart of Scotland. Our accommodation was the eco-friendly Loch Ossian Hostel, run by the non-profit charity, Hostelling Scotland. We spent a wonderful weekend hiking, star-gazing, reading, drinking whisky and catching up in the beautifully remote loch-side setting in the Grampian Mountains. It’s important we disconnect from technology and our responsibilities once in a while to reconnect with ourselves. This is often more challenging than we think; the temptation to ‘quickly’ check our phones often results in scrolling through our feed for hours and making impulse purchases. About to hike a munro in the rain! Spending a weekend away somewhere remote without the temptations of technology is the easiest way to reconnect. I can vouch that after spending a weekend at Loch Ossian Hostel, I returned to Edinburgh with my zen intact. The Loch Ossian Hostel ticked all my boxes for several reasons. I have been mindful of my impact on the environment recently, so imagine my delight when I found out Loch Ossian Hostel is a Green Tourism awarded eco-hostel. The hostel runs entirely on locally sourced hydro power, has composting toilets and a reed bed soakaway for grey water (water waste from showers, sinks and washing machines). Recently hot showers have been installed (with an eco setting). The self-catering kitchen is modern, stocked with everything you need to cook a delicious warm meal after a day in the mountains. The dining area is a comfortable and cosy space, and warms quickly thanks to the fireplace. There is also a neat overhead drying rack to hang your clothes if you happen to be caught out by the Scottish weather! There is an abundance of wildlife in the area, including a local herd of deer with the stag making frequent visits to the hostel! Unfortunately, we didn’t meet the stag, but we could hear him calling to his females from the hills. The kitchen is well-stocked and cosy! Other wildlife that can be spotted in the area include: black and red grouse, goshawks, merlins, black-throated divers, ptarmigans, golden eagles, dotterels, golden plovers, mountain hare, otters, peregrine falcons, and pine martens. There are three munros virtually on the doorstep of the hostel, and an easy hike that circumnavigates Loch Ossian, making it a perfect location for hikers of all levels. The hostel closes during the day for cleaning, encouraging you to get outside to soak in the surroundings. It remains open in cases of extreme weather. You can book the Loch Ossian Hostel from £19 per night here! Loch Ossian Hostel can only be reached by train, bicycle, or on foot- it is not accessible by car. The hostel is easily reached by catching the train to Corrour (which runs direct from Glasgow Queen Street) and following a clear 4×4 track for 1 mile. Don’t forget to pack whisky and a good book! Loch Ossian Hostel lies within the Grampian Mountains (also known as ‘the Grampians’). It is an area steeped in history; some of the first people of Scotland, the Caledonians, inhabited this area during the first century. The first ever recorded figure in Scottish history was the Chieftain of the Caledonian tribe, Calgacus. This was recorded by the Roman historian, Cornelius Tacitus. Apparently, Calgacus and his tribe fought against a Roman army led by Gnaeus Julius Agricola at the Battle of Mons Graupius in AD 83 or 84. The Romans were unable to defeat the strong Calidoni warriors, and fled the the safety of the south. While many historians debate the existence of Calcagus, it is clear that there were battles between the Calidonians and the Romans here. The Romans were not able to penetrate north of the Grampian Mountains for hundreds of years, resulting in the construction of Hadrian’s Wall to keep the “barbarous” Calidonians out. There is a special feeling about being in the mountains where the ancient Calidonian tribe once lived. The Loch Ossian Hostel is a fantastic base for hill-walkers and munro baggers of all levels. There are several options of hikes to chose from, but I’ve listed four that begin right at the doorstep of the hostel. Walkers may like to begin with the Loch Ossian circuit before dipping their toes into something harder, such as munros Beinn na Lap, Sgor Gaibhre and Carn Dearg. All of these routes can be downloaded from the Walk Highlands website. The circuit of Loch Ossian is the easiest walk in the area. You can begin this walk by following the track that you took to access the hostel, turning left at the fork. Follow Loch Ossian anti-clockwise on a clear 4×4 track. At the head of the loch lies Corrour Lodge, a wildlife refuge. The GPS waypoints for this walk can be downloaded here. Beinn na Lap is considered one of the easier munros in Scotland over 3000 feet. The railway station is already 1300 feet above sea level, leaving you with much less of a mountain to climb. This munro is also right next to the Loch Ossian Hostel, and can be admired while having a pot of tea from the picnic tables outside. The distinct, but rough track in some areas is fairly easy to navigate. This munro was officially the first one I’ve ever hiked! The GPS waypoints for this munro can be downloaded here. Leum Uilleim is a short, yet rewarding hillwalk. It is best known for appearing in the film Trainspotting. You begin this walk from the Corrour train station, and it conveniently loops to take you back around to the station. This corbett gives good views of Loch Ossian, Ben Nevis, and the peaks around Glen Coe. The GPS waypoints can be downloaded here. For those looking for a challenge, the munros Sgor Gaibhre and Carn Dearg offer just that. Despite Walk Highlands describing these munros as “unspectacular,” there is nothing unspectacular about the view it offers over Loch Ossian. These two munros are best tackled over the course of one day. There is a combination of pathless hillsides and clear tracks, but can be boggy in places. If you are looking to escape the hustle and bustle of city life and head into the highlands, spending a weekend at Loch Ossian Hostel offers the perfect combination of remoteness, adrenaline and relaxation. Staying at this hostel is truly one for the bucket-list, and a unique Scottish experience you’ll never forget! 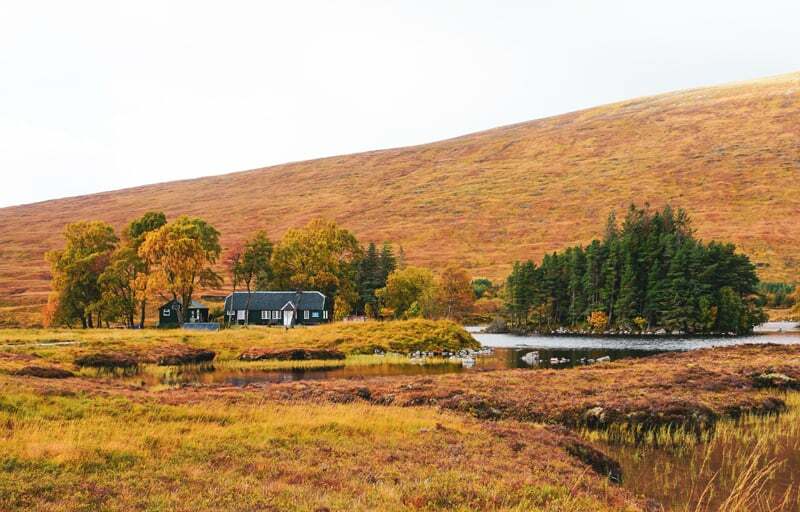 Have you stayed at the Loch Ossian Hostel or tried any of the hikes in Corrour? The hostel looks so cozy!! I’m usually one of those “I don’t do hostels!” people, but this one really has me rethinking that. Thanks for sharing!